The Lake Shore Railroad Storehouse Used as a Morgue. Everett, CS. Fritz Hirter, the Janitor, Making a Diagram in the Sand of the School Boxes for Fire Marshall Brockman. Everett, CS. Look carefully at the paired photos to the right. Concentrating on the larger image, respond to these questions. Cleveland News. 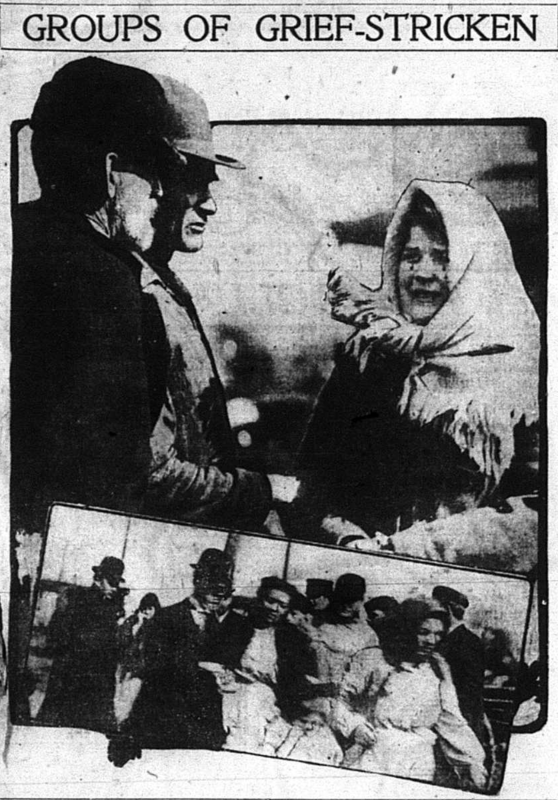 Mar 8, 1908. From where did the photographer shoot it? Is the photograph more interested in the men or the woman? Equally interested in both? Do their clothes tell you anything about the people in the picture? A thin, black outline that was not part of the original photo has been drawn around the woman’s scarf. Why? What is the effect of the outlining? What is the relationship of the people in the photo to one another? How would you describe their interaction? What are they saying and doing? The photographer probably didn’t pose these people, but he chose an angle to create this particular composition. What does the position of the people in the frame convey to you? How would the photo be different if it showed the woman in profile and the full faces of the men? What is the effect of making everything in the background an indistinct blur? Color photography didn’t exist in 1908, but sometimes people hand colored photographs. How would this image be different in color? Does the smaller picture on the bottom impact the way you see the larger picture above it? How much does the caption for this image help you understand it and how much is left for you to infer? Who is grief stricken? The woman? The men? All three of them?